To register for a course, it must be past the release date in the course settings (published) and activated. You will not be able to publish and activate an incomplete course (a course without at least one section and one lesson within each section created). After completing the course content and previewing it for accuracy, click the green Activate button at the top right corner of the Course Edit screen. Once activated, a course must be temporarily Deactivated to edit content. NOTE: We strongly recommend against editing a course where users are already enrolled. This could throw off the user's progress percentages, navigation and scoring if the content is re-ordered. If a course is Activated before its release date, it will not appear in the course catalog for registration until the release date (publish date). This enables you to prepare courses in advance, and automatically turn on registration for that course on a specific date. 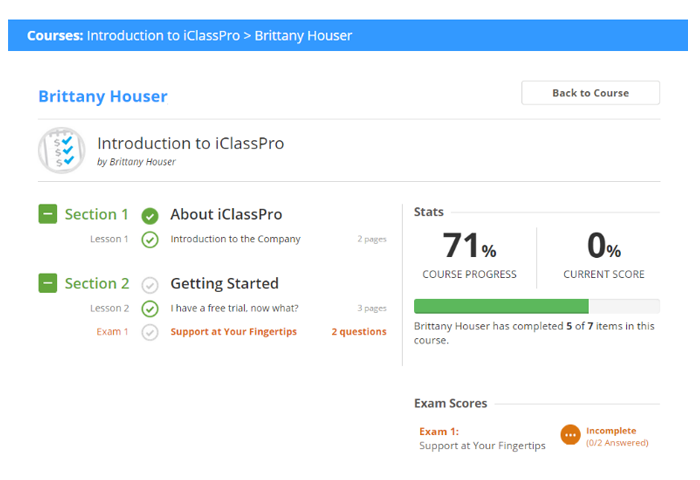 After a course is activated and published, users can enroll. As they progress through the course materials, information about their activity becomes available in the course dashboard. There are also two basic reports that Account Administrators and Organization Managers can utilize to oversee user progress. This report is a list of student courses which have not yet been completed. Optional filters allow you to narrow down the results to specific courses or organizations. This report is a list of courses which students have completed. Optional filters allow you to narrow down the results to specific courses or organizations. From the information included in these reports, you can also access student information and individual course progress in more detail. Click on a Student’s Name to see the Student’s profile. From there, you will have access to view User Info, current and completed Courses, and any Order history from past shopping cart checkouts. 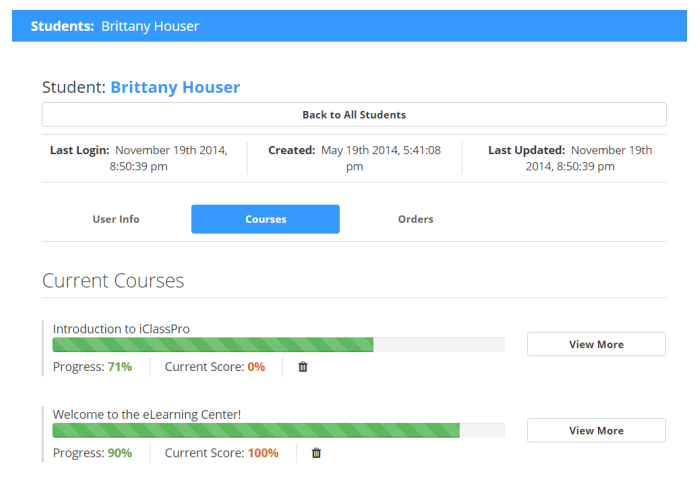 Click on the Course Name to see the student’s itemized course progress. Then use the +/- symbols next to the course sections to view itemized progress.